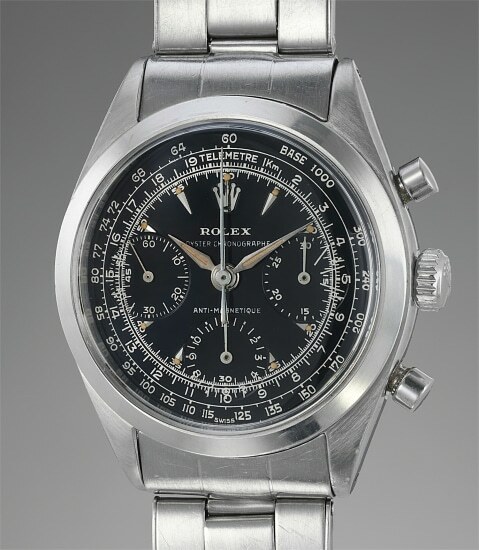 Introduced in the early 1960s, reference 6238 can be considered the link between the “old school” Rolex chronograph production and the Cosmograph Daytona. In fact, it features already an Oyster-style case (albeit lacking the screw pushers, which will be introduced with the Daytona reference 6240) and a 3-counter dial layout very similar to that of the Daytona. The model also shares the same calibre as the very early Daytona examples: Valjoux cal. 72B. The most notable difference is the presence of the tachymeter scale on the dial, which on the Cosmograph will be moved to the bezel. The tachymeter scale on the dial grants these watches an overall much more vintage look due to the fact the rest of the graphics have less space to develop - a situation accentuated by the smaller diameter of the model. The final result is a very complex dial design, definitely closer to the style typical of the 1940s and 1950s, rather than the minimalist looks in fashion throughout the 1960s and 1950s. The dial of the present watch, however, goes well above and beyond what collectors are used to seeing on this model. In fact, it is an example of rare black glossy dial. Such dials were used in extremely restricted amounts at the very beginning of the 6238 production: any collector finding such a dial would be immensely delighted, but finding a black glossy 6238 dial in the condition of the one featured in the present piece can be considered a truly once-in-a-lifetime opportunity. Miraculously, it would appear that the passage of time hardly left any sign on it. The gloss finish is present, free of any scratches and absolutely unclouded. The luminous material too is absolutely flawless and evenly aged to a charismatic hazelnut hue. The condition of the case is nearly as good as that of the dial: all proportions are respected and it does not present signs of careless polishing: the edges of the lugs are crisp, as is the one of the bezel. Even its original expandable bracelet is offered in superior condition, with all the links properly returning to their place when the bracelet is released. The stamping 3 64 to the clasp indicates this bracelet was made in the third trimester of 1964, absolutely correct for a watch whose case dates to 1963. The present watch will satisfy the demands of the most fastidious vintage Rolex collectors and would without a doubt be counted among the crown jewels in any Rolex collection.